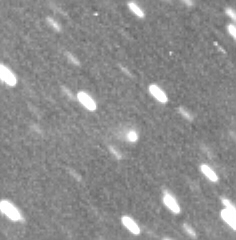 Here’s an image of Comet 178P (Hug-Bell) just 3 nights shy of 14 years after discovery at Farpoint. The 30 x 1 minute stacked image was taken 12-7-13 with the 22″ reflector at Sandlot Observatory. There’s a faint but obvious coma extension to the West North-West ( PA ~ 285). It’ll stay just under 18th magnitude for another month or so. It’s currently about 3 degrees southeast of Jupiter.